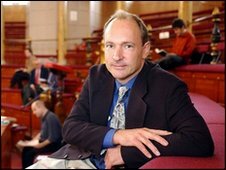 Web founder Sir Tim Berners-Lee has unveiled his latest venture for the UK government, which offers the public better access to official data. A new website, data.gov.uk, will offer reams of public sector data, ranging from traffic statistics to crime figures, for private or commercial use. The target is to kickstart a new wave of services that find novel ways to make use of the information. Sir Tim was hired by PM Gordon Brown in June 2009 to oversee the project. Developers have already built a site that displays the location of schools according to the rating assigned to them by education watchdog Ofsted. "It's such an untapped resource," Sir Tim told BBC News. "Government data is something we have already spent the money on... and when it is sitting there on a disk in somebody's office it is wasted." A beta, or test, version of the site has been running since September, with more than 2,400 developers registering to test the site and provide feedback. The site also shows the possible uses of the data, such as PlanningAlerts, a free service that combs local authority planning websites looking for planning applications. It then automatically e-mails details of applications in the local area to anyone who has signed up for the service. Another site, FillThatHole, allows people to report potholes and other road hazards across the UK. It uses location data from the Office for National Statistics. "A lot of this is about changing assumptions," said Professor Nigel Shadbolt of Southampton University, who helped develop the website. "If [the data] can be published under an FOI (Freedom of Information) request why not publish it online?" The site currently contains 2,500 data sets but the pair hope it will continue to grow. "It is a job that is never going to be entirely finished," said Prof Shadbolt. "Government is always collecting data." One of the key data sets they are trying to include is geographical location from the Ordnance Survey (OS). "That will make a real difference to the way that people make sense of the information," Prof Shadbolt said. He said they were "currently in discussion" with the OS and were hopeful that the data would be available on 1 April. In November, the government announced that most Ordnance Survey map data would be freely available online in 2010. Currently, it is only available free of charge to small-scale developers. Prof Shadbolt is also trying to extend the project to cover local government information. The site is part of a growing trend amongst governments to be more transparent with their data. In the US, the Obama administration launched data.gov, which offers feeds from various departments including the US defence department and Nasa. London Mayor Boris Johnson has also announced the city's authorities will open an online data warehouse on 29 January with more than 200 data sets relevant to life in the capital. "This is a tremendous opportunity for UK firms to secure better value for money in service delivery and to develop innovative services which will help to grow the economy," said Stephen Timms, Minister for Digital Britain.